During the Second World War, seven seaforts were built in 1941-42 to protect the Thames Estuary. 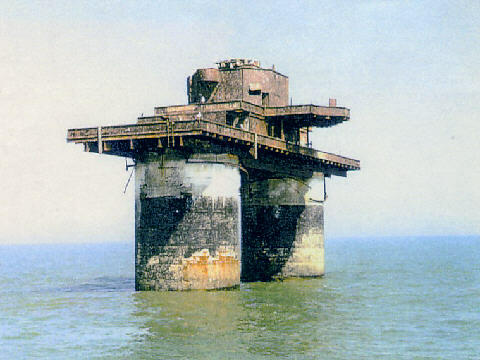 The designer of all the forts was Mr. G. A. Maunsell, hence the name. Four were built for the Navy and were situated at Knock John, Tongue Sands, Sunk Sand and the Roughs and consisted of two hollow concrete legs in which one hundred men lived, with a gun platform on top. Each weighed 4500 tonnes and was preconstructed before being towed out to sea and sunk into position. 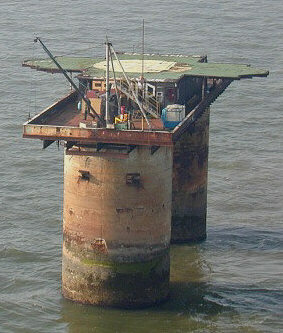 Roughs Tower is 6 miles off the Essex coast. It was occupied in 1967 and as it is outside the 3 mile territorial limit it was declared an independant state, the Principality of Sealand. the top tier of the fort has been replaced by a helicopter landing pad. Tongue Sands Fort succumbed to the sea in 1996 and Sunk Sands Fort was destroyed by the Army in 1967.